Moisturising body milk. 1000ml. BB Sensitive. 0% Parabens – 0% Ftalatos. Non-greasy body milk that is easily applied and quickly absorbed, leaving the skin silky and hydrated, ideal for daily moisturising for small and new-born babies. With highly moisturising properties from its content in shea butter, for regeneration, hydration and repair. Essential oils of calendula and chamomile, with soothing, healing and anti-inflammatory properties. Effectively strengthens the hydro-lipid layer to maintain a natural level of hydration. Protects from sunlight and heat. Composed by: Gel Shampoo 500ml. + Moisturising body milk 500ml. + Eau de toilette 500ml. 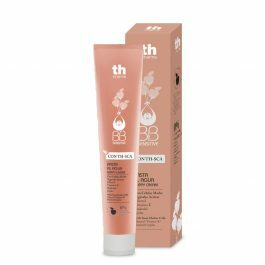 Nappy cream with TH-SCA. BB Sensitive. For babies with nappy rash, or sore or irritated skin. PARABEN AND PERFUM PREE. Ideal formula for the prevention and sooting of irritated skin around the nappy area. Effectively protects the skin against irritation caused by urine or faeces and nappy irritation. 6 products kit. BB Sensitive. Composed by: Gel Shampoo 500ml. + Moisturising body milk 500ml. + No-rinse cleansing fluid 500ml. + Eau de toilette 500ml. + Nappy cream balsam 100ml. + Facial moisturising cream 60ml. CERAMIDES… PROTECTION FOR YOUR HAIR!